The valley of Vajont is a tributary valley of the Piave valley, extending perpendicular to it from the east to west, in its upper part the large catchment area is smoothed by glacial activity, and at the valley mouth the Vajont creek excavated a narrow, deep gorge. This geomorphological situation, and the vicinity of industry in the Po plain, made the valley an appropriate site for a dam and a hydroelectric power station. Construction works at the dam site were initiated in 1956 and completed in 1960, at this time it was the highest doubly curved arch dam in the world, rising 261.6 m above the valley floor, 190m broad across the top, with a storage capacity of the dam lake of 150 to 168 million cubic meters. Filling of the reservoir began in February 1960. By October, when the depth of the reservoir had reached 170 m, joints opened as an M-shaped crack almost 2km long across Mt. Toc at 500-600 m above the valley floor. On 4 November, with the depth of the reservoir at 180 m, some 700.000 cubic meters of material slid in about 10 min from the toe of the moving mass into the lake. Attempts were made to stabilise the landslide by inducing movement of the mass until it reached a new condition of stability. Since movement had occurred during filling of the reservoir, it was inferred that raised water pore pressure in the flanks of Mt. Toc was the key destabilising factor. Accordingly, it was assumed that additional movement at a controlled, slow rate could be initiated by elevating the level of the reservoir in a careful manner. Similarly, it was assumed that movement could be halted by lowering the reservoir's level. 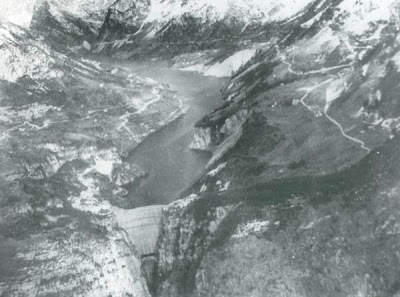 The strategy appeared to have been successful until mid-1963 when, between April and May, the depth of the reservoir was rapidly increased from about 195 to 230m. Rates of slope movement increased slightly but never exceeded 0,3 cm per day. By mid-July, the depth had reached 240m, and some of the control points indicated small increases in displacement to 0,5cm per day, increasing until mid-August to 0,8cm day. By early September, the depth of water was 245m, by which time the slide velocity had accelerated to 3,5cm day. In late September, the water level was slowly dropped in an attempt to reduce the rates of movement, and by 9 October, the reservoir's depth had been reduced to 235m. Even so, slope movements continued to accelerate to more than 20cm per day. At 22.39 local time on 9 October, the mountainside collapsed. Within 30 to 40 seconds, some 270 million cubic meters of material crashed into the reservoir, filling completely the 400m deep gorge behind the dam, the offshoots of the landslide travelled to 140m up the opposite bank, reaching some buildings of the village of Erto. At that time, the reservoir contained 115 million cubic meters of water, the landslide pushed the water out of its way, producing a wave with a maximal height of 230m, and pushing a 100 to 150m high wave over the dam into the gorge leading to the Pave valley. The wave crashed onto the villages of Longarone, Pirago, Villanova, Rivalta and Fae. Within minutes, about 2000 lives had been lost and the villages swept from view. Fig.1. 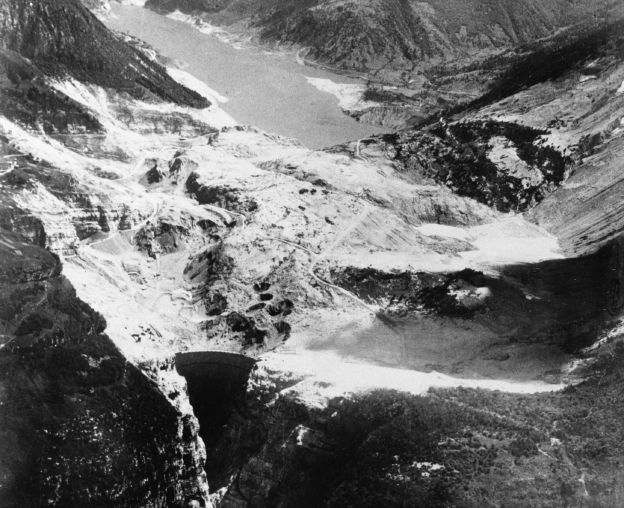 Aerial photo of the landslide deposits, May 1964 (SEMENZA 1964). Geological surveys of the construction site begun in the late 1920s. The area is characterized by a succession of Jurassic/Cretaceous to Eocene marls and limestone, dipping to the valley axis. 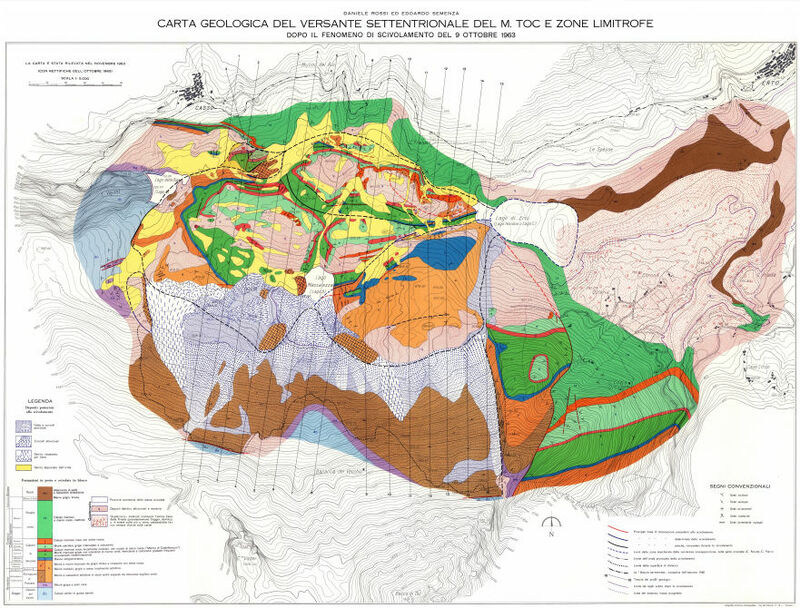 Research carried out after the event realized the presence of interbedded layers of green claystone (5-10 cm thick) in the limestone of the Fonzaso Fm. (Oxfordian; 10-40 m thick), and its possible role as failure surfaces. Between 1956 and 1960 it was realized that the slopes of Mt. Toc were more prone to instability than expected, since the mountain's outer flanks consisted of an ancient landslide deposit and not of bedrock, as initially inferred. The Vajont River subsequently excavated the gorge into the landslide deposits and underlying bedrock. Fig.2. Eduardo Semenza, in July 1964, the geologist, son of the engineer who planned the dam, was one of the first to recognized the large ancient landslide deposits characterizing the site of the reservoir. 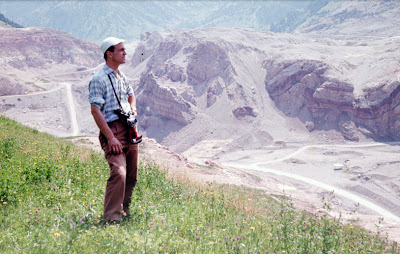 In the background is the deformed bedrock of one of the landslide "nappes" of the event of 1963 recognizable (unit 1) (photo credits Remigio Urro, 21 July 1964). The landslide deposits of 1963 can be subdivided in three units, a lower part of layered bedrock slipped of as a single mass (unit 1), deformed but coherent, an upper unit of more fragmented material (unit 2), and a third unit consisting of sand and gravels deposited by the flood wave (unit 3). Fig.3. Geological map of mount Toc before and after the landslide of the 9 october 1963. In orange adn brown the Fonzaso Fm (brown = stratigraphic horizon with claystone), the main rupture surface, in pink and green younger limestones, in yellow the sediments (sand-gravels) of the flood-wave, white talus/debris deposits of subsequent rock fall. 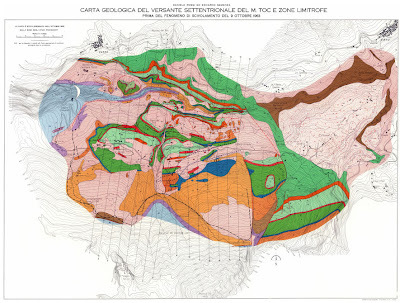 SEMENZA E. (1964): Sintesi degli studi geologici sulla frana del Vajont dal 1959 al 1964.